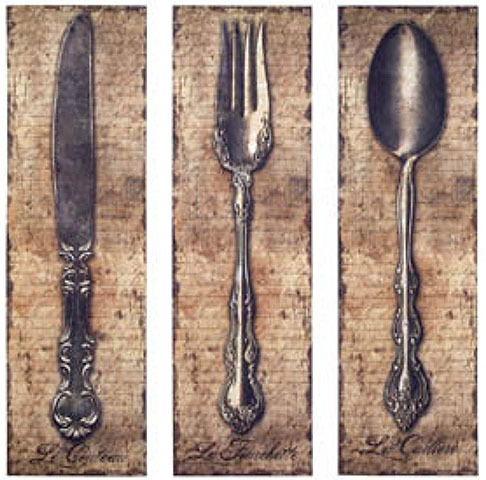 Perfect for a restaurant or kitchen at home, there is something about displaying artwork based on kitchen cutlery that always seem to fit well. It fits better than a display of “antique” appliances in my humble opinion. The framed canvas artwork is 37 1/2 X 12 X 3/4 and is an usual art piece in that it is vintage as opposed to modern in it’s depiction of cutlery. Written on the bottom is “Le Couteau”, “Le Fourchette”, and “Le Cuillère” which are the french words for the respective flatware items. It’s currently on sale at a great price and I recommend ordering while you can.